Expedition Update: This expedition has been delayed until 2019 due to some issues related to the research project. We anticipate Bridget Ward heading out with the team in October 2019. A Weddell seal and pup out on the sea ice near McMurdo Station, Antarctica. Photo by Alex Eilers. Weddell seals are one of the best studied seals and a classic example of adaptation to the extreme Antarctic environment. A large body size and thick blubber layer help them to stay warm both on and under the ice. Their streamlined shape, body oxygen stores, and collapsible lungs allow them to reach dive depths of 600 meters (almost 2,000 feet!) and remain under water for over an hour. However, they do not begin life with these advantages. 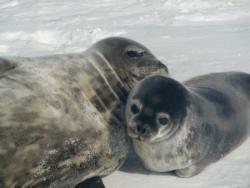 Weddell seal pups are born on the sea ice with a small body size and almost no blubber. The question is: What does it take for a Weddell seal to survive and successfully make the transition between two extreme environments – above and below the Antarctic sea ice – in only a matter of weeks? To answer this, Cal Poly scientists and a marine mammal veterinarian will venture to Antarctica to study the development of thermoregulation and diving in Weddell seals. 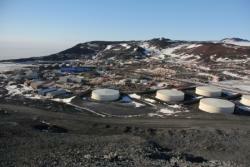 A view of McMurdo Station from Ob Hill. Photo by Tim Spuck. While in Antarctica, the research team will be living at McMurdo Station, the U.S. Antarctic Science Center. McMurdo is the capable of housing up to 1,258 residents, the largest community in Antarctica. McMurdo Station is on Ross Island, a volcanic island (with the southernmost active volcano, Mt. Erebus) south of New Zealand in the Ross Sea. McMurdo Station has its own science labs, engineering centers, dormitories, galley (kitchen), and even a US post office. 29 August 2018 Only 30 Days Until The Ice…..
Project Funded Title: Growing Up on Ice: Physiological Adaptations and Developmental Plasticity in Weddell Seal Pups Across Two Extreme Physical Environments. Bridget Ward grew up in the small town of Wales, Massachusetts. She has been teaching at Central High School in the city of Springfield, Massachusetts for eight years. Her courses include biology, pre-AP biology, pre-AP biology laboratories, and AP environmental science. Bridget attended Westfield State University and earned both a Bachelor of Science in Biology and a Master of Education in Secondary Biology. Since graduating she has continued seeking out additional educational experiences including traveling to the Galápagos with the University of Arizona to study Marine Biology and to Costa Rica with Texas A&M University as an EarthWatch Fellow learning about the implementation of conservation policies. While she was growing up, Bridget's parents encouraged learning through exploration by traveling around the world. She continues this exploration by taking advantage of school vacations to visit new locations and uses these experiences to develop new lessons. She believes strongly in teaching geo-literacy in the classroom and engages students in curricula by addressing how what they are learning is applicable in life beyond the classroom. Dr. Heather Liwanag is a comparative physiologist at California Polytechnic State University, San Luis Obispo. She is interested in the physiological adaptations of animals to their environment, and the evolutionary processes involved in those adaptations. Much of her research has focused on thermoregulation (the regulation of body temperature) and energetics (metabolic rates) in vertebrate animals, including seals, sea lions, and even lizards. Her current project is studying the development of thermoregulation and diving in Weddell seal pups in Antarctica. I look forward to your expedition! It's been so great to meet you! I'm looking forward to following! Great post, Bridget! Loving the sense of humor in your blog posts. So glad you were able to find a polar bear to make your students happy! Can't wait to follow your expedition!